The irony of this goals link up is that it has taught me way more about goals I am not setting, extending grace to myself and those around me, and where my weaknesses lurk than it has about achieving big lofty goals. When Hayley called this Goals with Grace, she wasn't kidding. Spend my time while Behr is at school at the house & pick my activities wisely -- I definitely worked better at this, but thanks to things popping up, September wasn't as productive as I had hoped. Continue my early morning routine -- this totally fell apart, but I hope October will be another fresh start. Family reading or exercise time during the 3-5 o'clock hours -- this is a positive work in progress. Still open to tips if anyone has any. I've been working on a writing project, at Influence I sat down with a mentor and we set hard deadlines. I am excited about the accountability and know it is a key component in me being able to reach me goals. Trim back the excess. We have excess in our lives that adds a component of anxiety to my day. Excess clutter, excess commitments, excess decisions. I am not entirely sure what this looks like, so it's a tricky goal to write. Most days I feel a few steps behind, I think because this excess is dragging my time. I have a tendency towards clutter, highly organized clutter, but I am slowly learning unnecessary clutter. October will be spend streamlining, cutting some of the negative excess from our lives. Write every day. I decided not to do the 31 day writing challenge because I want to focus on my project from Spring. But that doesn't mean I can't still be encouraged. I want to write every day just for the sake of writing, honing the craft and improving my skill. Start my mornings in worship. I fell out of rhythm with a crazy September. October is about resetting my mornings I include prayer, reading my bible, and some exercise. Better breakfast. With a bit of planning, the boys and I are all happier about breakfast. Cold cereal and cinnamon toast have been our go to for a few weeks. I am ready to reincorporate baked oatmeal and other hearty breakfast options. What are your favorite healthy/winter breakfast meals? 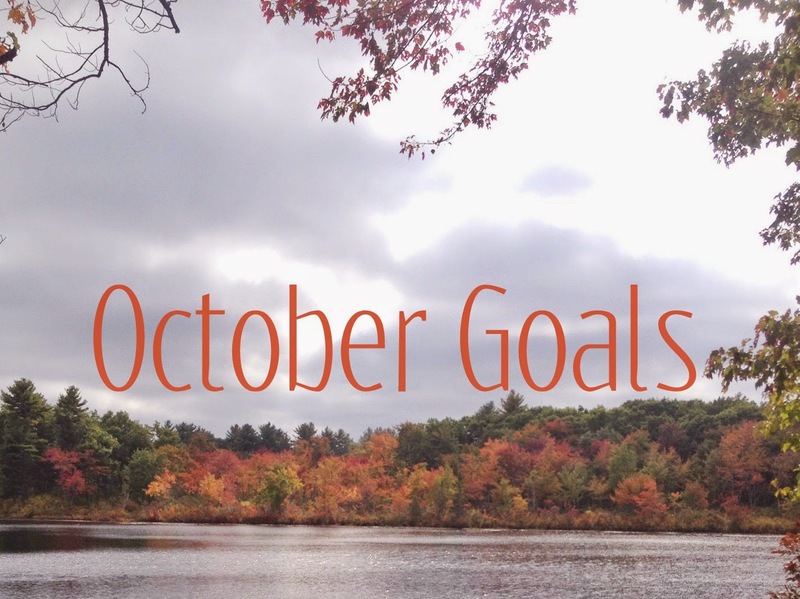 I love your October goals! I have also been working on getting my mornings back on target when it comes to spending time with the Lord. Now that I have a baby, I am always up early - so I know it is the perfect time to sip some coffee and worship. Even if it is just listening to a podcast or worship music. I'm in the process of decluttering as well! Problem is I am a sentimental person, so EVERYTHING has meaning and importance for me, so it is a hard process! Anyway, our favorite breakfasts are: crock pot steelcut oatmeal (isn't it nice to have it ready and waiting when you get up? ), eggs in omelette form (cheese makes everything better) and cut up fruit topped with plain yogurt and homemade granola. Also, when I make things like waffles or pancakes, I make a huge batch and freeze them so I can just heat them in the toaster in the morning. I love your goal on trimming back the excess! Definitely something I need to do this month!! My favorite breakfast is any kind of waffles, despite how unhealthy they can be.